Holy Nobleborn Princess Anna of Kashinsk died on 2 October 1338. Her holy relics were uncovered on 21 July 1649. The solemn transfer of her relics from the wooden Uspenie-Dormition cathedral into the stone Resurrection church occurred on 12 June 1650. 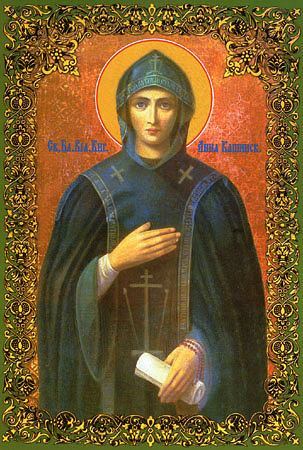 To the day of 12 June was appointed also the restoration of churchly veneration of Saint Anna. The Holy Nobleborn Princess Anna of Kashinsk, a daughter of the Rostov prince Dimitrii Borisovich, in 1294 became the wife of the holy Greatprince Michael Yaroslavich of Tver. (He was murdered by the Mongol-Tatars of the Horde in 1318, and Comm. 22 November). After the tormented death of her husband, Anna withdrew into the Tversk Sophia monastery and accepted tonsure with the name Evphrosynia. Later, she transferred to the Kashin Uspenie-Dormition monastery, and became a schema-monastic with the name Anna. On 2 October 1368 she expired peacefully to the Lord. The sons of Saint Anna continued in the confessor's deed of their father: Dimitrii Mikhailovich ("Grozye Ochi" "Dread Eyes") was murdered at the Horde on 15 September 1325; and later, Aleksandr Mikhailovich, Prince of Tver, was murdered together with his son Theodore (Feodor) on 29 October 1339. Miracles at the grave of Saint Anna began in 1611, during the time of the siege of Kashin by Lithuanian forces. The saint appeared to Gerasim, the church-warden of the Uspensk cathedral, and said, that she would implore the Saviour and the MostHoly Mother of God for the deliverance of the city from the foreigners. At the Sobor (Council) of 1649 it was decided to uncover her relics for general veneration and to enumerate the holy Princess Anna to the ranks of the Saints. But in 1677 Patriarch Joakim raised the question to the Moscow Sobor whether her veneration should be discontinued in connection with the problem of the Old-Ritualist Schism, which made use of the name of Anna of Kashinsk for its own purposes. In 1909, on 12 June, there occurred her second glorification and the universally observed feastday established.